How To Repel Sharks - We Love Sharks! How To Repel Sharks - We Love Sharks! Circling Sharks: How Can You Repel Them? Out of the nearly 500 species of sharks in the earth’s waters, only about a dozen are potentially dangerous to people. Even at that, human beings are not their preferred prey. Nevertheless, divers and professionals working in environments with high concentration of sharks are interested in reducing risk in a way that doesn’t harm the sharks. Which brings us to the issue of shark repellents. But before we discuss shark repellents, let’s remember that the risk of a shark attack is extremely low. You’ve probably heard or read some of those figures. The odds of getting killed in a shark attack are 1 in 3,800,000, while you’re more likely to die from stroke (1 in 24), heart disease (1 in 5), or a car accident (1 in 84). Unfortunately, shark attacks though extremely rare still occur and as a result people get anxious and rightly so too. A direct result of this has been the upsurge in sales of different kinds of shark repellents. But how effective are these products in doing what they claim to do? Can any of them really repel sharks? Let’s find out. – Shark Repellents And How They Work. – Some Common Types Of Repellents. 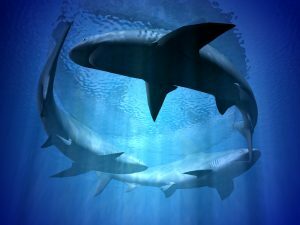 – Can Shark Repellents Repel Sharks? The Facts And Our Take On The Matter. Shark Repellents And How They Work. A shark repellent is any device or method designed to repel sharks and keep them away from an area. They work by interfering with one or more of the many senses sharks use to detect their prey. Such senses might be smell, hearing, sight or the ability to detect electromagnetic fields. These repellents are used to protect people when they get into the oceans or to protect the sharks from human activity. Research and use of shark repellents date back as far as the 1940s when the US Navy used them to protect stranded sailors and airmen in the Pacific Ocean during World War II. Repellents may be natural or artificial. Some Common Types Of Repellents. The general belief is that sharks are repelled by the scent of a dead shark. After some period of study, researchers were able to identify and isolate the active components in dead shark bodies responsible for repelling other sharks. They discovered that certain copper compounds, like copper acetate, when combined with other ingredients, could mimic the odor of a dead shark and drive live sharks away from human beings in the water. Though, there is still a lot of mixed results, a number of products have been introduced into the market based on this belief. 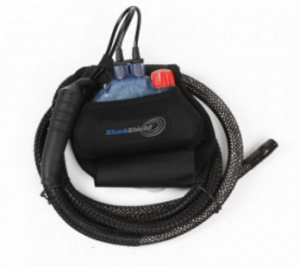 Shark Chaser: On of the most popular product based on this discovery is Shark Chaser a product patented by Stewart Springer. Springer was a renowned ichthyologist and herpetologist, and an expert on shark behavior. Shark Chaser contains copper acetate and dye among other thing to repel sharks and make it difficult for the shark to see the user. It was used by the US Navy between 1943 and 1973 with 70 percent effectiveness. 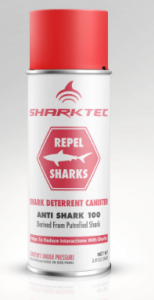 Anti-Shark: Based on the same theory, SharkTec, a New York based LLC, devised a shark repellent spray made up of dead shark tissue extract and packaged into an aerosol can. Divers, snorkelers and swimmers can carry the small sized can on them while in the water. When deployed, it releases a cloud of repellent into the water around the user that creates a “temporary safety zone” according to SharkTec. SharkTec states that it repels 15 different species of sharks. Note that the concentration of repellent will eventually disperse and the sharks may come back so it’s important to get out of the water as soon as possible. Semiochemicals are naturally occurring chemical “messengers” that are used for communication between individuals. Pheromones are an example of semiochemicals. Animals and plants emit them for different reasons; to attract prey, for sexual attraction, to repel potential predators and to warn other animals of their kind to flee a perceived danger. In 2014, SharkDefense partnered with SharkTec to manufacture semiochemicals in canister form that can repel sharks. SharkTec is licensed to manufacture and sell the products. They teamed up with Dr. Patrick Rice of SharkDefense and Dr. Eric Shroud of Oak Ridge Shark Lab, New Jersey to make products that are safe for humans and the sharks too. Apparently, when the sharks come in contact with the compounds in the cans, the sharks in question will shift from hunting mode to flight mode. In addition, they will “warn” their fellow shark brethren in the vicinity to stay away. Sharks have special sensory organs in their snouts called ampullae of Lorenzini. These organs are very sensitive and will detect even very small electrical currents like the heartbeat of nearby fish. Electrical shark deterrents emit a small electrical current into the water, which interferes with the ampullae of Lorenzini and overstimulates it causing the organs to spasm. The discomfort may be enough to make the shark turn away. Shark Shield: So far, Shark Shield is the only electrical repellent available to consumers that’s been shown to be effective at deterring sharks from coming close enough to prey to bite. The product is made up of a two-meter cord that trails behind the user and generates an electrical field. Divers and swimmers wrap the device (Freedom 7) around their ankle, while surfers and kayaks use a different model (Surf 7) that is installed directly onto a board. Who knew magnets in water could repel a shark? Apparently nobody, till a scientist mistakenly dropped one in a tank of small nurse sharks and noticed how they quickly darted away from it. It appears magnets have a comparable power to deter sharks like electrical fields by overstimulating the ampullae of Lorenzini. Sharkbanz and Shark Shocker are two products that work based on this principle. They both incorporate magnets into a small ankle or wrist band and they are much cheaper than electrical deterrents. 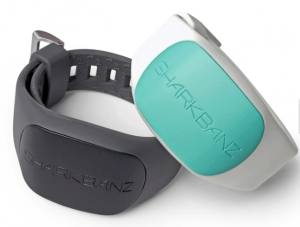 Though Sharkbanz claims its band can repel different sharks like bull sharks and small tiger sharks, they don’t recommended it for repelling the great white shark. There are no independent studies into the efficacy of Sharkbanz or Shark Shocker for now. This kind of shark repllent works by mimicking the sounds of a killer whale (orca). Results so far are inconclusive and experiments with seals showed that the seals quickly noticed the sounds were not coming from a real orca and they ignored the playback. Obviously, sharks may do the same too. Tests are still going on. SharkStopper, for instance, is an example of an acoustic shark repellent band that’s worn on the user’s leg. The general belief among ocean goers is that wearing an all-black wetsuit will make you look like a seal; one of the favorite meals of sharks. An Australian company, Shark Attack Mitigation Systems (Sams), has decided to change this by designing a collection of colorful wetsuits. They range from camouflage pattern in different shades of blue to a black and white striped wetsuit. The idea behind the blue wetsuit is to blend in with the surrounding water, while the black and white wetsuit has banding along the limbs to resemble a banded sea snake, a dangerous food option for sharks. The black and white stripes also mimic the appearance of pilot fish, a common companion of sharks. The wetsuits are still undergoing independent testing. Can Shark Repellents Repel Sharks? The Facts And Our Take On The Matter. Our first concern with shark repellents that raises a red flag is the fact there are no guarantees for these items. We are talking about human life here, after all, and none of these manufacturers can give 100 percent assurance that these products will save you in a real-life, face-to-face meeting with a predator shark. The major challenge lie with getting human subjects to test endanger themselves in order to test the efficacy of these items. – Dead shark scent. So far, the products we listed above in this category have a 70 percent success rate. Independent experiments like the one done in a 2015 Essence of dead shark repellent MythBusters episode, by the hosts Adam Savage and Jamie Hyneman show some positive results using extracts of dead sharks. They were able to drive away a group 10 to 20 Caribbean reef sharks and nurse sharks in a few seconds during two separate experiments. Interestingly, in both instances, the sharks did not return for over 5 minutes. But if a person were faced with a shark, especially suddenly, would they have time to activate these deterrents? – Electrical repellents. A lot of mixed results here. In 2012, the Australian government tested this theory by strapping electronic repellents on seals. The results were inconclusive because sometimes they worked. At other times, the sharks ignored the electronic field and went straight for the seal; repellent and all. Tests on Shark Shield show that it can actually stop a shark from attacking, but not every time. Recent studies on the device by scientists at the University of Western Australia (UWA) showed the same thing. It could prevent great whites and tiger sharks from attacking most of the time, but not all the time. Some individual sharks would still attack. In summary, the test showed that the great white would avoid a static bait with SharkShield 10 out of 10 times on the first approach. Subsequently, the figure dropped. You can read more about that here Tests on SharkShield . A note of warning: the same group of UWA researchers discovered that electrical repellents in the form of an anklet were ineffective at repelling sharks. It seems this is due to the configuration of the device in question. Where the electrodes are spread far apart (like in Shark Shield), there is more protection to repel sharks than when there are close together on an anklet or band. Another concern among the public is that since sharks use electrical currents to find their prey, wouldn’t emitting the same currents from a device attract them to check you out? Well, sharks use this sense at close range. According to Dr. Charlie Huveneers, a shark expert at Flinders University, Australia, it’s unlikely a shark would be attracted to a personal electrical deterrent device from a long distance. You’ll need to decide for yourself if you are willing to take that chance or not. Studies are still going on with other options and innovations that will help repel sharks. One of such studies involves using extracts from the Red Sea Moses sole. The Moses sole is a kind of fish that can repel a shark through its secretions. The secretions are released when the shark bites it. There’s been a lot of interest in the Moses sole since the 1970s but there is no practical application yet because the extracted chemicals are perishable. Also, the repellent has to be injected directly into the shark’s mouth to be effective. The websites of shark deterrent manufacturers have videos and testimonials of happy customers using these items. However, none of them will give you 100 percent guarantee of safety in the water. Users are strongly advised to note the limitations of these devices and avoid unnecessary risks based on a false sense of safety. Remember that we do not sanction any kind of deterrent that will harm sharks in any way. All these products are nontoxic and will not harm the sharks, or you, the user.